Taking transparency to a new level: SC Johnson air freshener collection discloses 100% of fragrance ingredients. You know that label you see, proudly displayed on the shelves of your local grocery store: “Contains Only Natural Fragrances!” You might think that means a product has fewer ingredients or that they are more pure. But in reality, both natural fragrances and synthetic fragrances are made up of tens or even hundreds of individual components that go undisclosed. Until 2016, that is, when SC Johnson became the first major consumer packaged goods company to launch a 100% transparent fragrance collection. 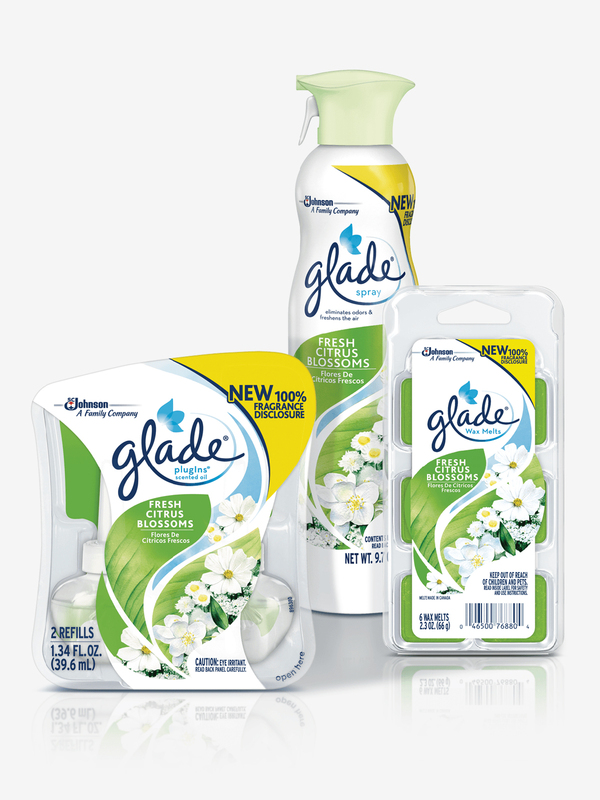 Our Glade® Fresh Citrus Blossoms line (online only) lists all ingredients down to the individual fragrance components. Chemical compounds are nature’s building blocks. They make up everything from the air we breathe to the water we drink – and the fragrances we use to spruce up our homes. Of course, not everyone will have a chemist’s understanding of the acids, aldehydes, esters, ketones and terpenes that go into a typical fragrance. But we believe it’s important to acknowledge that all fragrances contain chemicals – whether the scent comes from an essential oil or a lab-created fragrance. In fact, cinnamon essential oil contains myrcene, estragole, methyl eugenol and safrole — all of which are listed on California Proposition 65 as ingredients of concern when used at significantly high concentrations. The presence of these chemicals does not mean fragrances are unsafe, as the concentrations are so low they pose no threat. But they do occur, and our goal is to be transparent about that. Scientific American wrote an insightful pieceon the fact that chemicals are everywhere. You might be surprised by what is inside a typical natural fragrance. Our launch of the Glade® Fresh Citrus Blossoms collection in 2016 went beyond other air freshener products with its 100% fragrance transparency. All the products’ ingredients are listed on the products themselves and on our WhatsInsideSCJohnson.com ingredient site. The collection features a premium room spray, PlugIns® Scented Oil Refills and wax melt refills. All the fragrance components used to create the Glade® Fresh Citrus Blossoms collection are nature-inspired and pass our rigorous screening criteria. By comparison, many products with natural fragrances remain a black box, with no transparency for users. If a product is safe, why does transparency matter? For us, it is about maintaining the open dialogue we have with the families who use our products. Perhaps surprisingly, it is up to each manufacturer to decide if they want to share information about what is inside their products. There are few product regulations when it comes to ingredient communication or disclosure. And frankly, we don’t think that is good enough. That is why we go beyond requirements. We want to do what is right, not just what is required. And that has led to a long legacy of firsts when it comes to transparency. 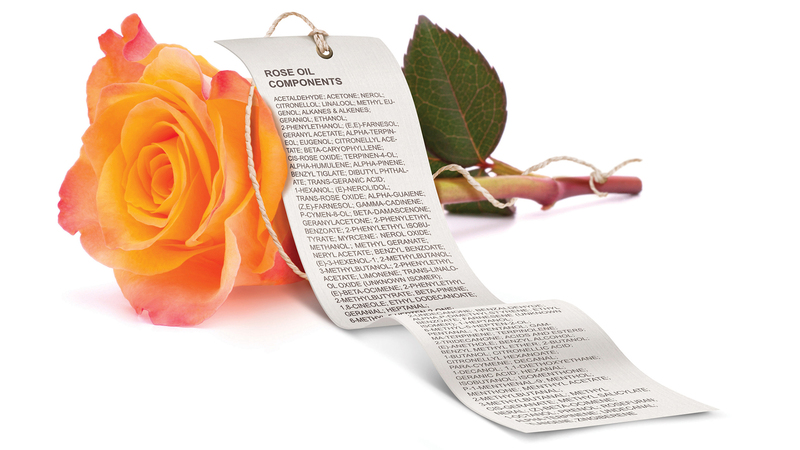 From our ingredient website launched in 2009, to communicating our fragrance palette in 2012, to rolling out product-specific fragrance disclosure in 2015…we keep working to give you more about what is in our products so you can make the best choices for your family.